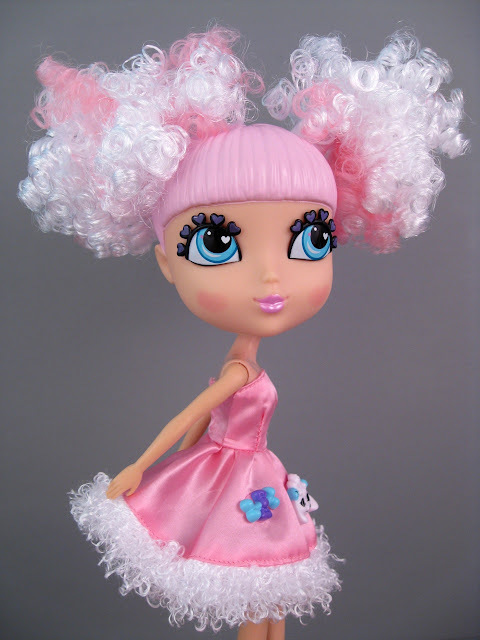 Cutie Pops Fashion Pups Doll, "Coletta"
This is the third and final review in a series highlighting the new Cutie Pops dolls. I reviewed the Crown Cutie doll Crystalina first, then the Hattitude doll Dakota, and now I will end by looking at one of the dolls in the third group of fall releases: the Fashion Pups. These dolls are more like the traditional Cutie Pops: they each have a two-ponytail hairstyle, extra hair, an extra pair of (closed) eyes, and plenty of pop decorations. The Fashion Pup dolls also come with a pair of small vinyl dogs. Cutie Pops Fashion Pups "Coletta." Cutie Pops Hattitude Doll, "Dakota"
This is the second in a series of three short reviews that will look at the new Cutie Pop lines. You can find the first review here: Crown Cuties Crystalina. 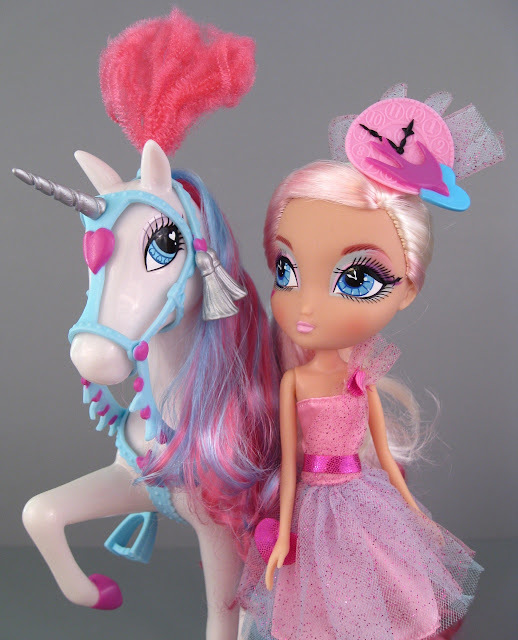 The next group of dolls I will look at are the Hattitude basic dolls. These dolls are wearing animal hats and have a single ponytail in back, rather than the two side ponytails that all other current Cuties wear. These dolls come with fewer accessories that the Crown Cuties or the Fashion Pup dolls, but they only cost $9.99. Cutie Pops Crown Cuties Doll, "Crystalina"
I have been a reluctant-turned-loyal fan of the Cutie Pops since their release last year. I have reviewed one of the first wave dolls (Cookie) and one of the more basic Swirly Brights dolls (Magenta). In a nutshell, my only substantial complaints with Cutie Pops so far have been that their eyes are a little crazy and they aren't very well articulated. Overall, I like the interchangeable hair and eyes on these dolls and find them to be a fun, economical alternative to dolls like Pullip and Blythe. I had some moments of concern over the summer when I noticed that Cutie Pops were getting less expensive, and they were not being re-stocked at Target and Toys R Us. I worried that the dolls weren't selling well and might be poised for discontinuation. I needn't have worried--Cutie Pops seem to be doing fine, and Jada Toys has rolled out an interesting triumvirate of new dolls for the fall. Cutie Pops Crown Cutie, "Crystalina." American Girl Mini Dolls "Rebecca" and "Kit"
When I visited the American Girl store in Boston, I had every intention of buying the historical doll, Rebecca. 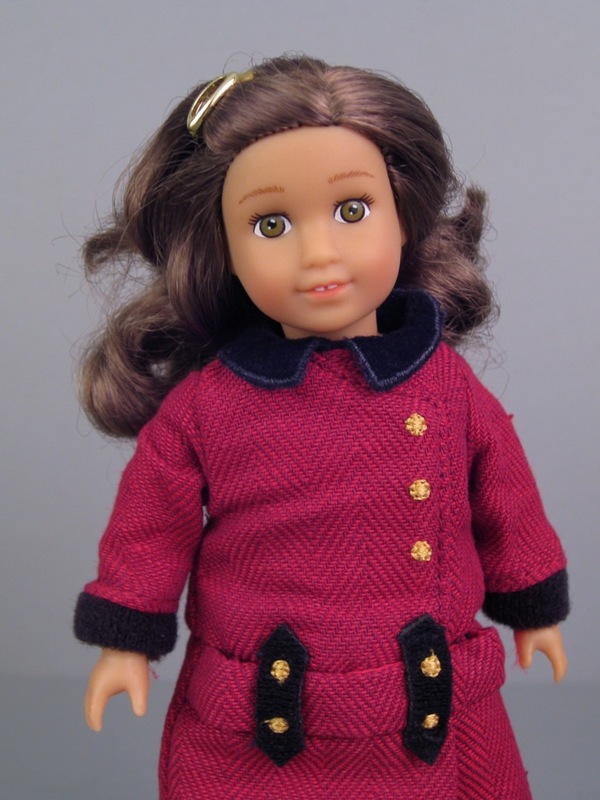 As you might recall, my shopping experience went a little differently than I'd planned, and I left with My American Girl #29...and a mini Rebecca. I love the idea of having a doll with a miniature replica. When Annette Himstedt used to make vinyl dolls, her club characters had miniature "Kleine" versions of themselves, and this always made the club dolls more tempting to me than the regular line. My other favorite miniature doll replicas include Lee Middleton's small versions of some of the older Artist Studio babies, the delightful collection of mini Pullip dolls, and the McDonald's Happy Meal miniatures of the Liv It's My Nature line. My Makie Doll, "Glythia," from the Makie Lab! 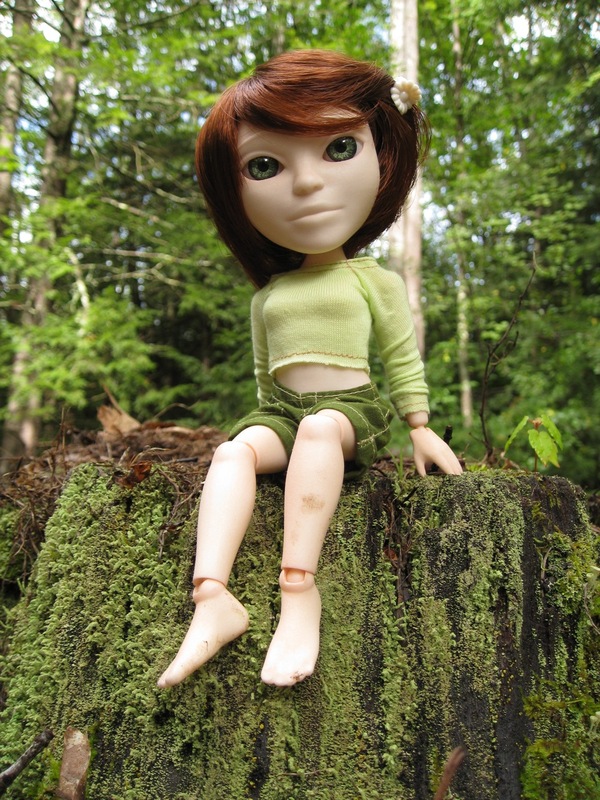 Makies are large-headed, highly articulated 10" dolls that are made in London. These dolls are special because each one is custom made from a unique digital design created by the customer. How does that work? Well, there's an easy-to-use customization tool on the Makie website that allows you to play around with various facial features, skin tones, wigs and clothes until you have a doll that looks good to you. It's a lot like designing a character on the Stardoll site--or in Skyrim, for any Dovahkiin readers out there. Once you have perfected your character, the Makie Lab uses a 3D printer to turn your digital design into an actual doll. It's a pretty incredible idea. Molly first told me about Makies way back in August of last year. After her tip, I immediately went and checked out the Makie Lab website. This is an extremely fun site because you don't have to buy anything or have any special skills to have fun designing a Makie. You can have as many virtual dolls as you want, change their features, write stories about them, plan outfits, and share your creations on social networks...all for free. If you want, you can also have the character you designed made into a real doll. I have been enjoying the Makie website immensely, and have designed and re-designed about 8 virtual dolls. However, it has taken me a whole year to actually place an order for the real thing. It took me this long partly because I couldn't decide which of my virtual Makies to make real. I also couldn't stop making little changes to my designs. Another obstacle is that having a doll made and shipped to the United States costs about $180, which is a hefty sum to spend on one doll. As in so many situations, curiosity eventually trumped reason, and I bought a doll. I was simply too eager to see how my creation would translate into three dimensions, and too curious about how a 3D printed doll would look and feel. Now that my doll has arrived, I am excited to share the whole experience with you. Custom Makie, "Glythia," by The Makie Lab. I was running errands on Wednesday and stopped by the toy aisle at Target just for fun. I was surprised to see a huge new stash of Our Generation goodies. There's a new articulated circus horse (beautiful! ), tons of outfits, a great selection of shoe packs, and a whole new display of $6.99 accessory sets. There are some beautiful pictures of these sets over at Doll Diaries, but one set in particular stood out to me. 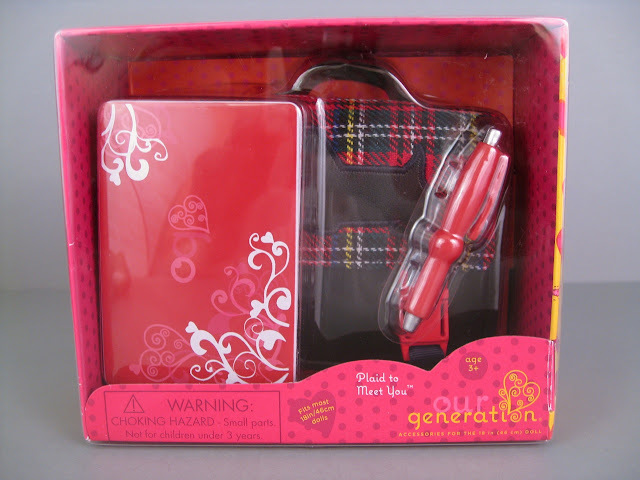 "Plaid to Meet You" accessory set. I have reviewed La Dee Da dolls a few times before. I wasn't too thrilled with my Runway Vacay Cyanne doll (her hair is very thinly rooted and her outfit simple) but I do enjoy my Dots of Style Dee's bright, rainbow hair and colorful outfit. I seem to have a thing for rainbow hair. I haven't followed the La Dee Da dolls very carefully since those two reviews, though, because I felt the line was somewhat dismissible. The dolls are cute--but never struck me as special enough to hold my attention. Well, my opinion changed when I saw the new La Dee Da dolls at Target the other day. 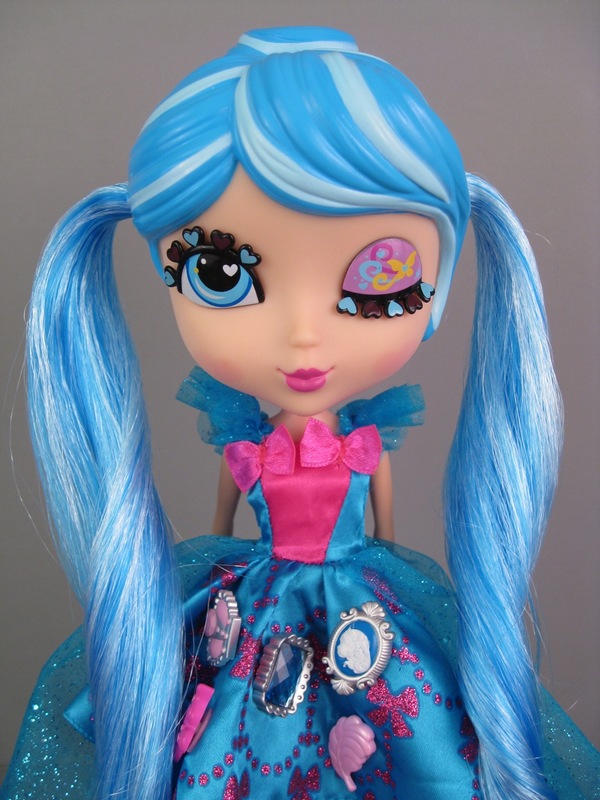 La Dee Da has two new groups of dolls so far this fall. The first group I noticed is called Fairytale Dance. I was interested in these dolls because I have been thinking about Ever After High and the new line of Fairy Tale High dolls and wondering why so many companies are getting into the fairy tale game all of a sudden. Even Cutie Pops has a new princess-themed line. I don't mean this as a complaint--I like fairy tale dolls because I am always optimistic that there might be a Cinderella character. Much to my delight, there is a La Dee Da Fairytale Dance Cinderella (exclusive to Toys R Us), and what's even better is that she comes with a horse. Eeee! La Dee Da Fairytale Dance "Cinderella and Prancie."